This type of gutter guard has been around for a long time. 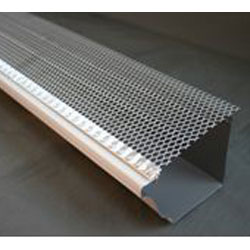 The aluminum mesh strains out debris from your gutters while allowing rain water to flow down and out of your gutter system – safely away from your foundation. Ox Mesh Leaf Protection – www.oxmesh.com A uniquely designed system that allows water to freely flow through it while keping debris out of your gutters. The stainless steel membrane is pourous enough for even the heaviest of downpours to not run off your gutters while the mesh keeps leaves, sticks and even shingle grit from clogging up the gutters. Alcoa Leaf Relief Leaf Relief’s patented design allows water to flow freely while debris is lifted away from gutter with a gentle breeze. Independent testing proves Alcoa’s Leaf Relief is 100% effective against leaves, twigs, pine needles and small debris. The Leaf Shelter gutter guard is an amazing guard system that keeps debris, seeds, acorns, twigs and leaves out of your gutters by catching them on a panel, where they are then blown off by the wind. As rain hits your roof and heads down towards the louver system, where it flows into a clean gutter and on to your downspout. The Leaf Shelter has been tested to withstand over 28 inches of rainwater per hour. Gutter Cap’s patented gutter guard design uses liquid physics, combining water surface tension, cohesion, and adhesion, allowing rainwater to adhere to the dome of the cap while leaves and debris simply fall off the roof. The existing Gutters become a free-flowing roof drainage system, saving you the hassle and danger of cleaning gutters and saving you thousands of dollars in damage each year. Gutter Roof incorporates roof granules into the finish for a better appearance and improved performance. We’ll help you navigate the various options and pick out the gutter guards that are right for you.